In the last couple weeks, or in the last week, I’ve noticed how the national and international news have ran stories on Sioux Falls, South Dakota and Fargo, North Dakota. Sioux Falls and Fargo fall along the north-south Interstate 29 corridor in far eastern Dakotas, and they originally served as railroad gateways to the northern portion of the Great Plains and American West. They share some similarities because of this. As well, they got one of the earliest urban foot-holds, and they also attracted colleges (back when the distinction between college and university was still quite distinct — a college could be a part of a larger university). In the first pieces — here, and here — on the “Fringe City” of Sioux Falls, The Atlantic Monthly’s James Fallows compared and contrasted this South Dakota city with Burlington, Vermont. The problem with this, of course, is realized when one looks at the history of both cities. Burlington, Vermont is a place with a dense population, and dense populations surrounding it. Sioux Falls and Fargo, in contrast, are places with comparatively dense populations, and they serve a rural surround that is much more sparsely populated. If you’re from Bismarck, ND (like I am), you will have in your collective memory stories about certain economically privileged friends in grade school and junior high and high school regularly getting to go to Fargo for the weekend so their parents could purchase them designer clothes. These friends could then return and inform the rest of us what was hip and cool. This, I have found, is one of the personal historical memories that I use to argue why I would be totally cool with a return to the school uniform (something Angus Young appropriated and continues to own on stage quite well). But that is another topic for another blog. The main point is that it reflects the reliance and tension, at least from the 80s and 90s, that Fargo and Sioux Falls and the rural surrounding areas generated: individuals living in these cities both loved them, and they loved to have contempt toward them as well. This, in turn, is a larger theme of the Great Plains, as you’ll hear similar stories from what central and western Nebraskans and Kansans have to say about their eastern cities. In the second piece, Fallows opines on the architectural history of Sioux Falls, and this reflects the larger theme of architectural history in the American West. Go to any town in the Dakotas, and a large chunk of the monumental architecture dates from before and just after the turn of the 19th century. This is often the period when the wood structures either succumbed to city-wide fires, or were torn down to make way for superstructures with sturdy granite and brick foundations (Fallows mentions the Richardsonian Romanesque architecture of Sioux Falls, and a comparable building in Fargo would be North Dakota State University’s Putnam Hall). This is also a period of history that had some of the greatest economic and un-ashamed monopolistic magnates, individuals with operations based out of the Twin Cities (for example, one of the prime reasons North Dakota has a state bank and a state elevator has to do with big Twin Cities bankers knowingly or unknowingly fleecing North Dakota farmers — eventually, North Dakota farmers said we’ll just create our own bank and mill if we can’t get decent rates and grain prices from Minneapolis and St. Paul). 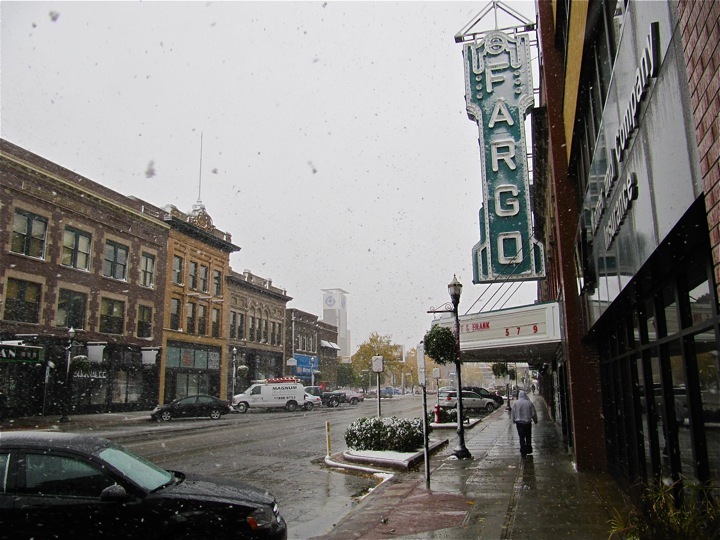 The iconic Fargo theater signage in downtown Fargo, North Dakota. ESPN’s College Game Day is looking to use this as a backdrop for their coverage of Saturday’s game. Photo by Aaron Barth, from October 2012. In the realm of Fargo, Slate.com ran a short piece on a proposed skyscraper to be built in downtown, Fargo (about 6 blocks from where I live). Skyscrapers (and grain elevators for that matter) on the prairie, I argue, look all the more cool because they are set against the horizontal backdrop of the Great Plains. Fargo, and North Dakota, are indeed booming, and not just because of petroleum. This Saturday, ESPN’s College Game Day is coming to downtown Fargo, to broadcast the football game between North Dakota State University and Delaware State University. While NDSU and the University of North Dakota (Grand Forks) no longer play one another in the historic regional football rivalry, I think both universities are getting more mileage for the state by playing non-North Dakota audiences. Even if a North Dakotan has absolutely no affiliation with NDSU or UND (which, considering the state is about 700,000, would be almost impossible), all of non-North Dakota watching this ESPN game may at some point attach said game to future encounters with North Dakotans. It’ll be up to us to figure out how we want to respond to that. I’m all for it. This entry was posted on Tuesday, September 17th, 2013 at 11:33 am	and tagged with Fargo, James Fallows, North Dakota, North Dakota State University, Sioux Falls, Slate.com, The Atlantic Monthly and posted in Uncategorized. You can follow any responses to this entry through the RSS 2.0 feed.